HISTORY: Clave is the Spanish word for "keystone" or "key" which indicates that the clave rhythm is the basis of authentic Latin rhythms. 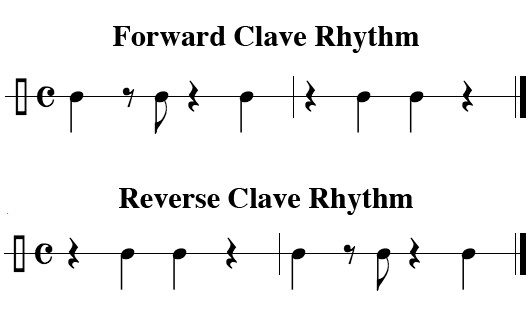 The repeated five-note pattern can be performed with a "forward clave rhythm" of three notes followed by two or a "reversed clave rhythm" of two notes followed by three. SOUND PROPERTIES: When the claves are struck together, they produce a loud, sharp, and resonant clicking sound. Due to the composition of the wood, there are often certain areas of the claves that sound better than other areas. These areas called "sweet spots" will provide a consistent sound. 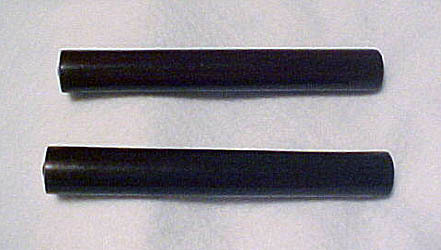 Special effects, such as rolls, can be obtained by holding the claves parallel to each other and striking them end to end. RANGE: This is an untuned percussion instrument and has no pitch range.